Enter the world of James Bond. 007’s movies attract some of the most aggressive promotions in the movie business. The latest Bond film, Spectre, had a budget of $350 million - advertising partners cover a large portion of that cost and help to promote the movie worldwide. James Bond has special value, with brands dishing out top dollar to be associated with the timeless character. GQ magazine’s recent feature on everything Bond is wearing shows the magnitude of influence. Historic British brands such as Sunspel (Bond’s t-shirts and undergarments) and Crockett & Jones (Bond’s shoes) have been fitting Bond for years, and have seen benefit in their association with the franchise - Sunspel’s site states, “The Sunspel name has been synonymous with the quintessential style of James Bond ever since we tailored one of our original polo shirts for Daniel Craig to wear in his role as 007 in Casino Royale.” Others, such as N. Peal, who sponsored the turtle neck Bond wears in the movie’s poster, saw the product sell out almost immediately. The value is certainly there. 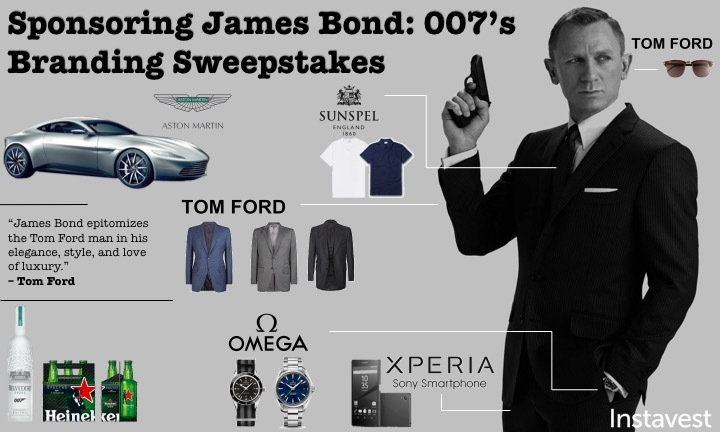 But how competitive is it to win the Bond branding sweepstakes? Heineken (AMS:HEIO) covered 1/3 of the total budget of Skyfall and launched a $100 million campaign with Daniel Craig ahead of the release of Spectre - at the very least, over 24 million people watched the advert on YouTube. They’re joined by Belvedere (EPA:MC) and Bollinger Champagne to round out Bond’s drink selection, in what is estimated to be quite an expensive endeavor. How would James Bond invest his money? We’d argue he’d want to replicate the world’s best investments. Find out how at Instavest - request access today.